Chia puddings, a new found craze in me. I m trying a lot of chia recipes, mostly for my breakfast. Today i tried a savory chia bowl with buttermilk and veggies and topped it with delicious mint-turmeric chutney. This chia dessert was made last week, when i made some fresh strawberry jam for my lil one. Yes, i call it dessert, because it has got a delicious strawberry jam in it and it is little too much for breakfast. Coconut milk and chia are match made in heaven. The natural sweetness in coconut milk so beautifully soaks up the chia, and you get a lovely feel when you a taste a mouthful of it. Flavors that are, not so dense, light and delicious. When you pair this coconut milk chia with fresh fruits, you get amazing desserts to end your meal. Strawberry jam used in this recipe needs just 20-30 minutes if your are making fresh, i dont like store-bought jams as they have too much sugar and god knows what all preservatives, if making for someone you love, why not make good stuff. These puddings are light on your tummy, you wont feel that you have gorged on something unhealthy, that said, this too, should be in moderation. 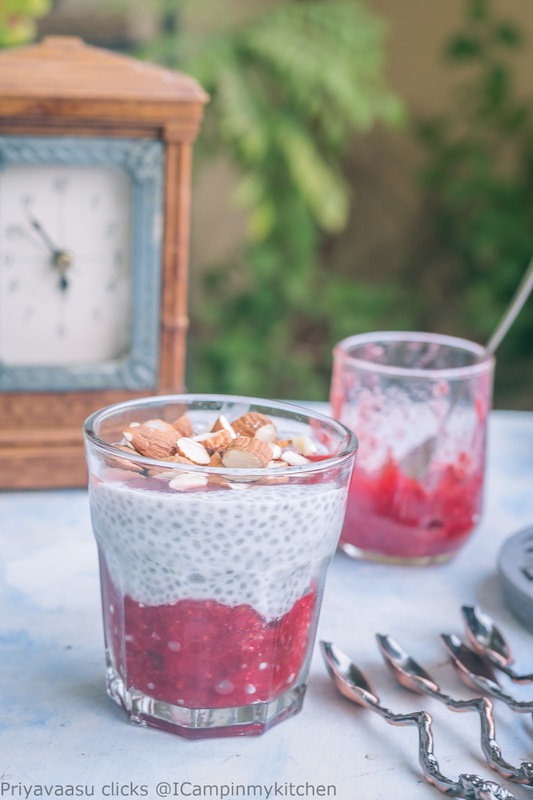 The below recipe will make two glass tumblers (IKEA Chai glass) of chia pudding. 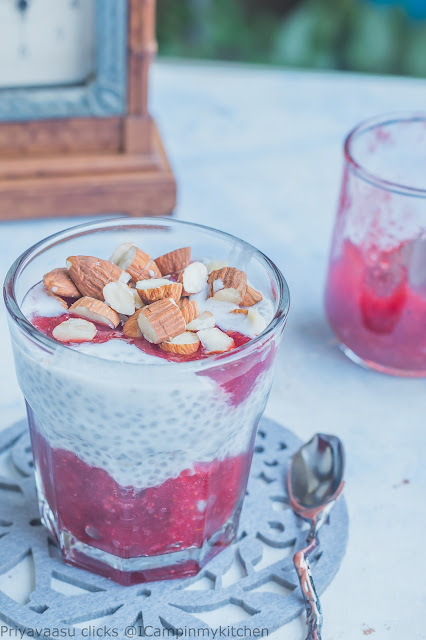 With Valentine's day on the cards, this is one delicious dessert to make for your loved ones, even my elder one loved the pudding, especially those chopped almonds on top added a great texture to the dish. If you are a health food junkie, then this is definitely your style of dessert! Go on, try it and let me know how you liked it!! Soak chia seeds in coconut milk for a minimum of 3-4 hours. I prefer soaking it overnight when i making it desserts like this. Once the chia is soaked, it is done, you just need to assemble them and enjoy. Take glass tumblers or mason jars or any dessert bowl in which you want to servet them. Layer the bottom with 2 tbsp of freshly made strawberry jam, top it with 2 tbsp of chia, if your jar/tumbler allows, do another layer of strawberry jam and chia. Top it with chopped almonds. Refrigerator for an hour or two and serve. Totally love the pictures in this post, that you have shot them in your balcony with the garden as background, so beautiful! I get queasy with chia so have them only I really want them, and yes, I love chia with fresh coconut milk! That jam would have just spiked up the whole breakfast bowl... yum! wow dear this look fantastic thanks for sharing keep posting.. This looks so fresh healthy and light. A prefect start of the day. Love the strawberry jam as well. I love the fact that strawberries can give us so many yum recipes. The combination with coconut milk to be made into a pudding is absolutely delicious. Love the pictures and the assembly in a glass! So loving those layers. I too loving chia seed recipes these days. I have bought a pack of coconut milk but never used it. Will try this recipe very easy to make. Cleck are beautiful those coasters n spoons. 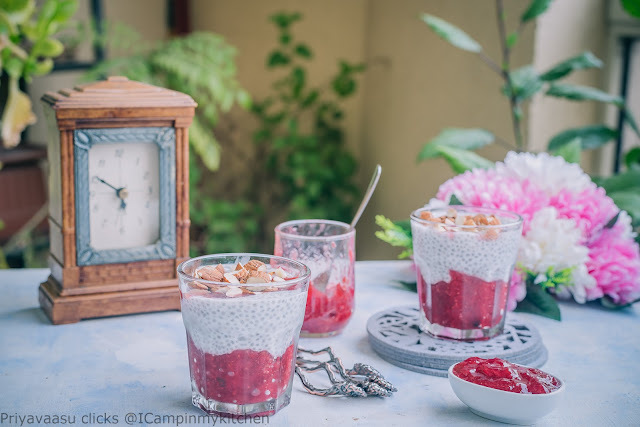 Chia Seeds and Strawberry make a lovely dessert.. Beautiful pics.. I think if my breakfast start looking like that I'd be a happy girl. Great share even I want to include chia seeds in my diet. I am at the edge of experimenting with Chia Seeds... your recipe is super simple and encouraging!! Loved it!! This looks so delish and easy to make. Lovely pictures. We love chia seeds and everyday they appear in our breakfast oats porridge! Such a tiny seed but mighty :) Loved your recipe! What a healthy and delicious recipe, tempting pictures! Such a gorgeous looking chia pudding. Love the gorgeous set up. Delicious healthy pudding, I make it often using a variety of fruits. Love your idea of using coconut milk instead of dairy one.